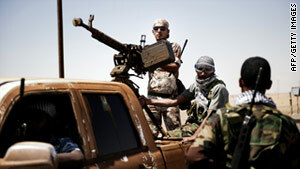 Libyan rebels arrive in the area of Ajdabiya, Libya, on Thursday, having returned from al-Brega. Instead, NATO said those strikes hit vehicles that were "part of an opposition patrol"
(CNN) -- NATO expressed regret Saturday after its aircraft mistakenly struck vehicles aligned with the Libyan opposition in the key and hotly contested eastern oil city of al-Brega. NATO did not provide details as to how many people, if any, died or were injured in Thursday's strike. But in a statement released Saturday, NATO admitted that its forces hit vehicles that were "part of an opposition patrol" -- an incident the military alliance described as "unfortunate." For weeks, NATO forces have been targeting forces loyal to longtime Libyan leader Moammar Gadhafi in an effort to prevent civilian casualties. Most of those strikes have come from missiles fired from off-shore ships or aircraft flying high above the north African nation, though earlier this month British and French attack helicopters did fly closer to the ground in al-Brega to more precisely go after targets in that city. Al-Brega is on a frontline -- east of Gadhafi's base in Tripoli and west of the rebels' headquarters in Benghazi -- in fighting that has taken place between the two sides over the past several months. In its statement, NATO said that "a column of military vehicles, including tanks," were spotted Thursday around al-Brega where Gadhafi forces "had recently been operating." During what it called "a particularly complex and fluid battle scenario," leaders in the military alliance ordered a strike after determining these vehicles posed "a threat to civilians." "We regret any possible loss of life or injuries caused by this unfortunate incident," NATO said in its statement.